Be the first to share your favorite memory, photo or story of Sherry. This memorial page is dedicated for family, friends and future generations to celebrate the life of their loved one. 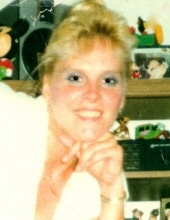 Sherry Lemley, 58 of Adrian, Missouri passed away December 24, 2018 in Kansas City, Missouri. Cremation, with memorial services 3:00 pm Sunday, January 6, 2019 at Mullinax Funeral Home, Butler (660-679-0009). A visitation will be held from 2:00 pm to 3:00 pm Sunday, prior to the service, also at the funeral home. Inurnment will follow in Oak Hill Cemetery, Butler, Missouri. Memorial contributions are suggested to the family. Messages of condolence may be left for the family at www.mullinaxfuneralhome.com. Sherry Gaye Lemley was born August 18, 1960 in Kansas City, Missouri, one of two beautiful twin girls, to Lenard Paul and Mildred Ruth Buchanan Greathouse. She was preceded in death by her parents, husband Troy Lemley, son Billy and her brother Johnny. Sherry is survived by her daughters, Michelle Powell and Nina Morris-Foit, five granddaughters, Hope, Kearstin, Allyssa, Vanessa, and Justice, one grandson, Brayden, along with five brothers, two sisters, many nieces, nephews, extended family members, and her fur baby Tiny Dancer. Sherry will be forever missed and remembered for her out going personality and her strength to make it through anything. To send flowers or a remembrance gift to the family of Sherry Lemley, please visit our Tribute Store. "Email Address" would like to share the life celebration of Sherry Lemley. Click on the "link" to go to share a favorite memory or leave a condolence message for the family.